Oldsmobile was a brand of American automobile produced for most of its existence by General Motors. It was founded by Ransom E. Olds in 1897. In its 107-year history, it produced 35.2 million cars, including at least 14 million built at its Lansing, Michigan factory. When it was phased out in 2004, Oldsmobile was the oldest surviving American automobile marque, and one of the oldest in the world, after Daimler, Peugeot and Tatra. 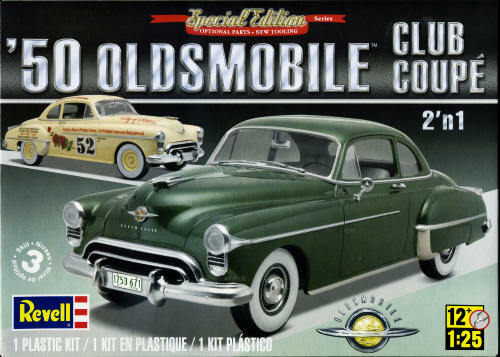 The closing of the Oldsmobile division presaged a larger consolidation of GM brands and discontinuation of models during the company's 2009 bankruptcy reorganization. ldsmobile entered the 1950s following a divisional image campaign centered on its 'Rocket' engines and its cars' appearance followed suit. Oldsmobile's Rocket V8 engine was the leader in performance, generally considered the fastest cars on the market and by the mid-1950s their styling was among the first to offer a wide, "open maw" grille, suggestive of jet propulsion. Oldsmobile adopted a ringed-globe emblem to stress what marketers felt was its universal appeal. Throughout the 1950s, the make used twin jet pod-styled taillights as a nod to its "Rocket" theme. Oldsmobile was among the first of General Motors' divisions to receive a true hardtop in 1949, and it was also among the first divisions (along with Buick and Cadillac) to receive a wraparound windshield, a trend that eventually all American makes would share at sometime between 1953 and 1964. Oldsmobile has not received a lot of kitting from the major manufacturers and this is particularly true of its cars of the early 1950s. So it was with much delight that I saw this kit on the 'new' shelf at the LHS when it first came out. I've a fondness for cars of this era and am patiently waiting for the day when the first car of my memory, the 1951 Chevrolet sedan, finally hits the kit shelves. Perhaps before I pass on, eh? Anyway, since Revell does not provide parts layouts, you'll have to get by with a written description. First off, the kit comes with a one piece body molded in white, like most of the rest of the kit. There is the usual opening for the hood. A separate X frame is provided on which to install the engine/transmission and the suspension bits. The engine is quite stock with cast iron exhaust and a single carburetor. The car comes with a single exhaust and a trailing arm rear suspension. Brake drum faces are provided for the inside of the wheels. The car also has a full cooling system and there are the usual accessories for the inside of the engine well. Inside, you have separate foot pedals and two bench seats. Door interior sections are also provided and if you are doing one of the racing cars, you have a roll bar to attach in place of the rear seat. A single piece dash and two piece steering wheel/drive column are provided. Wheels are two pieces and come with a chrome trim ring. These fit into hollow tires. For the glass, you have separate pieces for the windows. Fender skirts are provided as well. There is a fair amount of chrome on this one and is very nicely done. Door handles, mirrors, hood ornament, wipers and plates amoung many bits are separate as are the head light and tail light assemblies. Instructions are well done and easy to follow. You can build one of three cars. One is stock, another is a racer from the American Stock Car Association and the third is the winner of the 1950 Pan American Road Race. 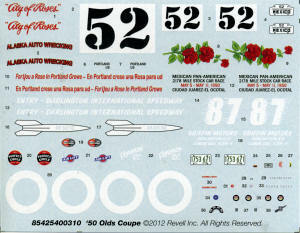 Due to the two racers, the decal sheet is pretty good size and is well done. I should mention that the broad whitewalls are provided as decals. I am not sure how well this has sold as this is, so far, the only boxing. Revell's 57 Chevy and 57 Ford two door sedans have had at least two boxing so far so I would expect another for this one. Hopefully it will sell well enough to provide me the '51 Chevy I so desire. Thanks to consignment sales for allowing the funds for this one.